In this issue, each of the articles selected either takes a critical approach to its research question or incorporates a careful perspective on the various racial, ethnic, gender, or other identities at play in its analyses. The first article shows that support for military action decreases when civilian causalities increase. The second criticizes the shift from peacebuilding to stabilization and counterterrorism operations. 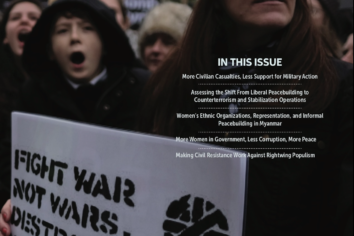 The third reviews women's informal participation in the peace process in Myanmar, and broader implications from barriers to their formal participation. The fourth suggests a link between women's participation in government, reduced levels of corruption, and higher levels of peace. The fifth details strategies for leftist civil resistance movements to confront rightwing counter-protests. The results of this critical approach empower us to see beyond our assumptions, to be surprised by the results of our work, and to view events of the world with a dash of skepticism.